Burgeramt – burgers (Krossener Str. 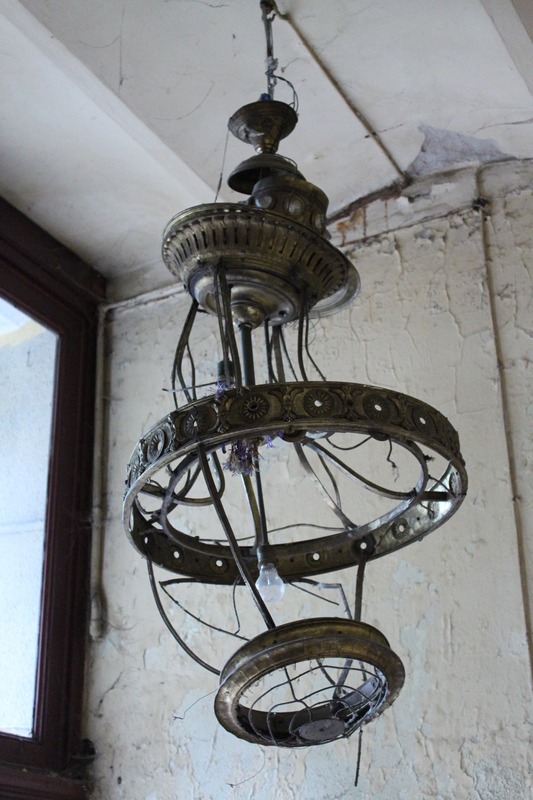 22, Boxhagener Platz, 10245 Berlin, U+S-Warschauerstrasse) – open daily noon till 3am. This is the best burger joint in Berlin. 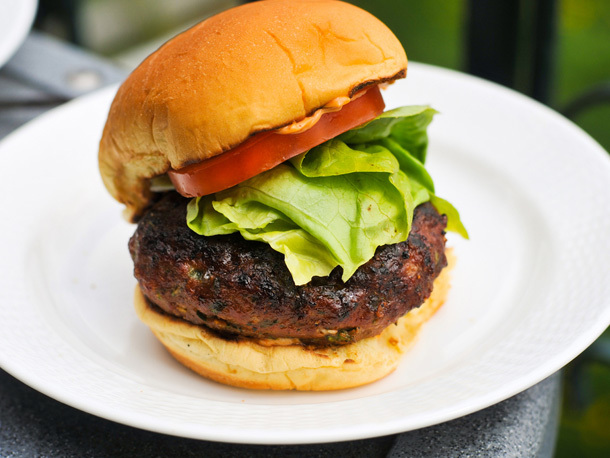 They have an unlimited variety of meat and vegetable burgers, toppings, sauces, and sizes. Everything is made from fresh ingredients and fast. 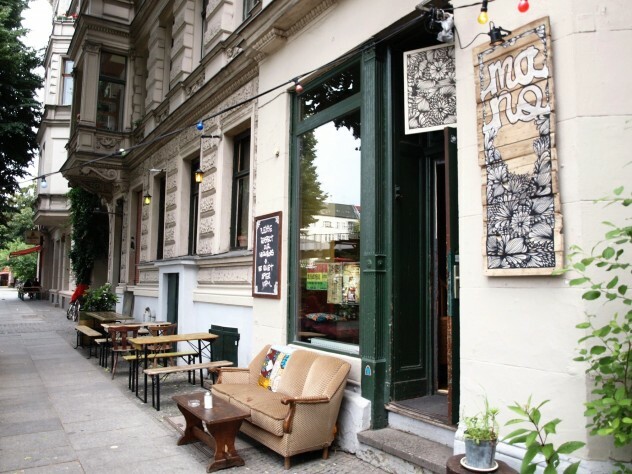 Located right next to the Boxhagener Platz square (popularized by the novel and film), in the heart of Friedrichshain, a lively area with many restaurants, boutiques, cafés, and bars. They have now expanded into the building next door and have inside sitting, which will be good for the winter. I’ve taken many friends to eat there and they all loved it and wanted to come back to it. So tell your friends! € 5 -10. Datcha – Russian cuisine (Gabriel-Max-Str. 1, 10245 Berlin) – open daily from 10am. Great atmosphere and a fusion of traditional Russian cuisine and the culinary innovations of today (as noted on their website). Owned by the same people who run Gorki Park in Mitte and Pasternak in Prenzlauer Berg. The food is exceptionally good. My friend Jasmine and I tried everything from their pelmeni to lamb burgers. € 10-15. Kaufbar – cafe (Gärtnerstraße 4, 10245 Berlin, U+S-Warschauerstrasse) – Everything in this café is for sale: the furniture, the décor, art, the dishes. Try their raspberry-mint soy milkshake! € 5 -10. Kinkibox Nähcafé – Sewing workshop and café (Seumestr. 21, 10245 Berlin) They offer different workshops and events, as well as a selection of coffees and cookies. Unfortunately, I found out about this place when it was too late, on the plane to Vienna. But it sounded too good not to mention it here. € 5 -10. 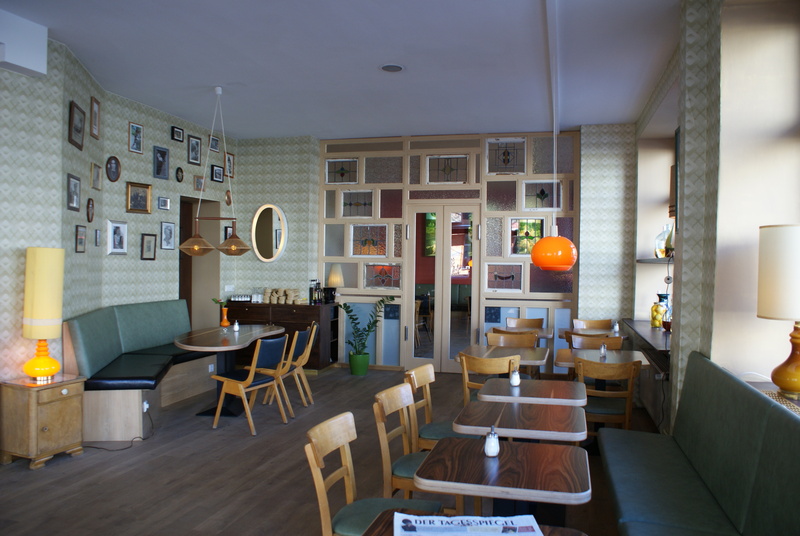 Gorki Park Café – Russian-inspired cuisine (Weinbergweg 25, U-Rosenthaler Platz) – very cozy place decorated with avant garde social realism art. Free WiFi. Open for breakfast, lunch, and dinner. The menu is a great mix of western hamburgers and eastern Borsch and pelmeni. The bar has imported Russian beer and Kvass on tap, German beer, and French wine. Typical Berlin. Try their pelmeni and vareniki! € 7-15. Café Fleury – French café (Weinbergweg 20, 10119 Berlin, U-Rosenthalerplatz) – Open 8am till 10pm during the week and 8pm on the weekends. French café with black-and-white French New Wave pictures framed on the walls. Specialize in breakfasts, sandwiches, lunches, and deserts.Try their cheese cake! € 7 -12. Napoljonska – Polish Bakery (Kastanienallee 43, U-Eberswalder Str.) – famous for waffles and crepes. Cozy small café and bakery, decorated in colorful pastel colors to resemble the pastries they sell. € 5 -10. Plazebo – Café and bakery (Katanienallee 26, U-Eberswalder Str.) – small cozy café and bakery with a great brunch selection. Good for studying and reading, quiet, with lots of light. Stay for a coffee or hot chocolate or take it to go. € 5 -10. Prater – Biergarten (Kastanienallee 7-9, U-Eberswalder Str.) – Large beer garden in the back open all summer. The Prater has been serving beer in Berlin since 1837! Reopened as a restaurant in 1996. Also features a performance venue for the Volksbühne, which once used to be housed here. € 10-15. An einem Sonntag im August – Café (Kastanienallee 103, U-Eberswalder Str.) – Open 9am until ??? (as their blog site states). Cozy couches inside, low key atmosphere, busy terrace. 2,5 Euro brunch buffet. € 5 -10. Babel – Lebanese restaurant (Kastanienallee 33, U-Eberswalder Str.) – sit-down and take-out, great food. Open daily 11am-1am. Try their Haloumi cheese wrap. € 5 -15. Kohlenquelle – Café (Kopenhagener Str. 16, U+S-Schönhauser Allee) – cozy place on the ground floor of an old Prenzlauer Berg apartment building. The tenants come down for breakfast in their PJs. Good for studying during the day, with lots of light and free Wifi. Delicious and fresh food. 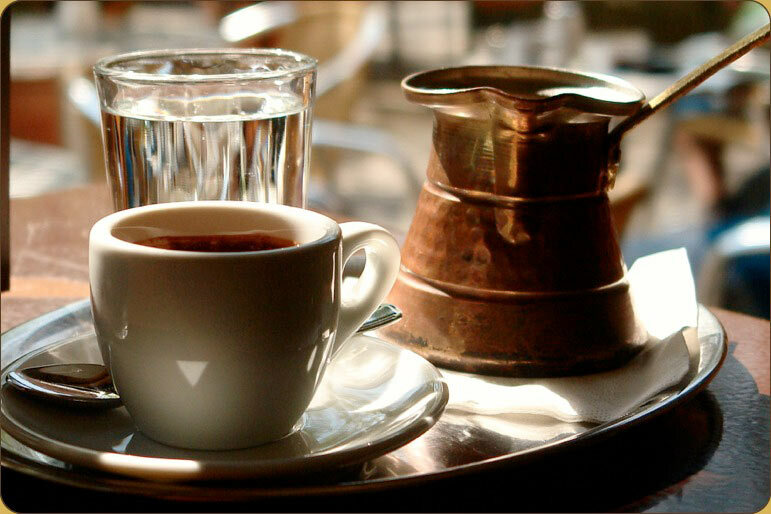 Good coffee and teas. Lively for drinks in the evenings. € 5-10 . Heimatlos (Husemannstr 2, Kollwitzplatz, U-Eberwalderstrasse) – great brunch place facing Kollowitzpark, a lively park surrounded by other cafés, shops, book stores, and restaurants. The name “stateless” refers to anyone who finds themselves in Berlin and is looking for a cozy place to hang out at (as the information provided on the menus states). € 10-15. Wohnzimmer (Lettestrasse 6, Helmholzplatz, U+S-Schönhauser Allee) – open from 9am until last man standing. 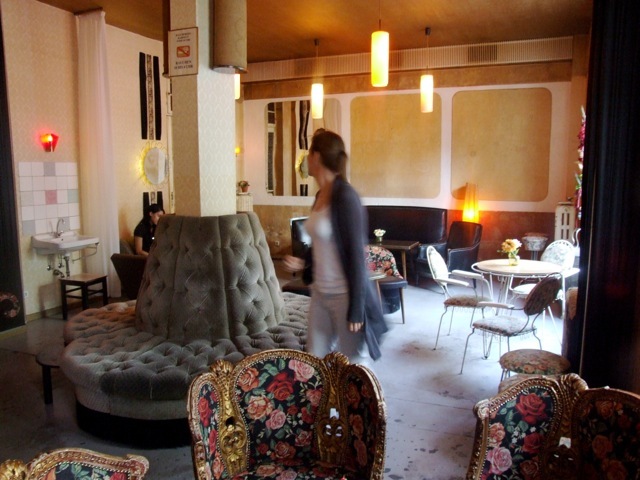 Cozy café with vintage couches, arm chairs, and chaise longues. Made to feel like your neighbourhood living room. Quiet and sunny during the day and turns into a lounge/bar in the evenings. Good for casual drinks. € 5 -10. Anna Blume Cafe – (Kollowitzstr. 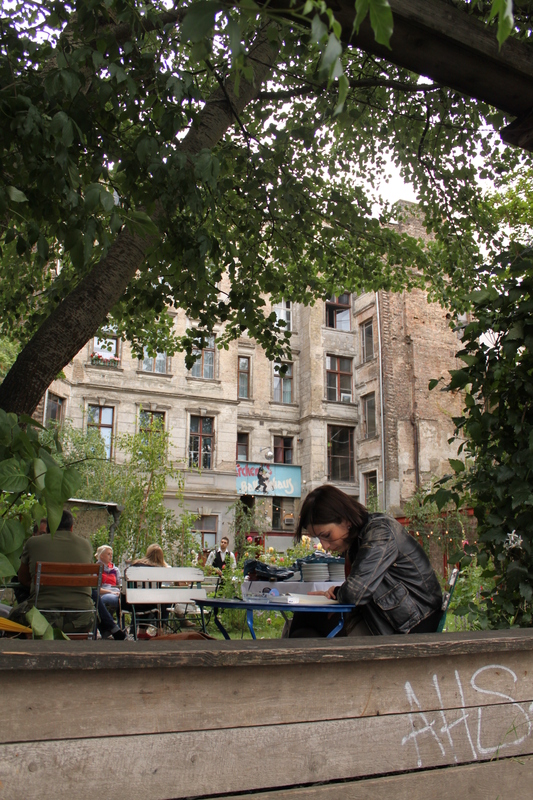 83, Kollwitzplatz, U-Senefelder Platz) Open daily 8am – 10pm. Named after a poem by Kurt Schwitters, this cafe and flower shop specializes in culinary and floral arrangements. 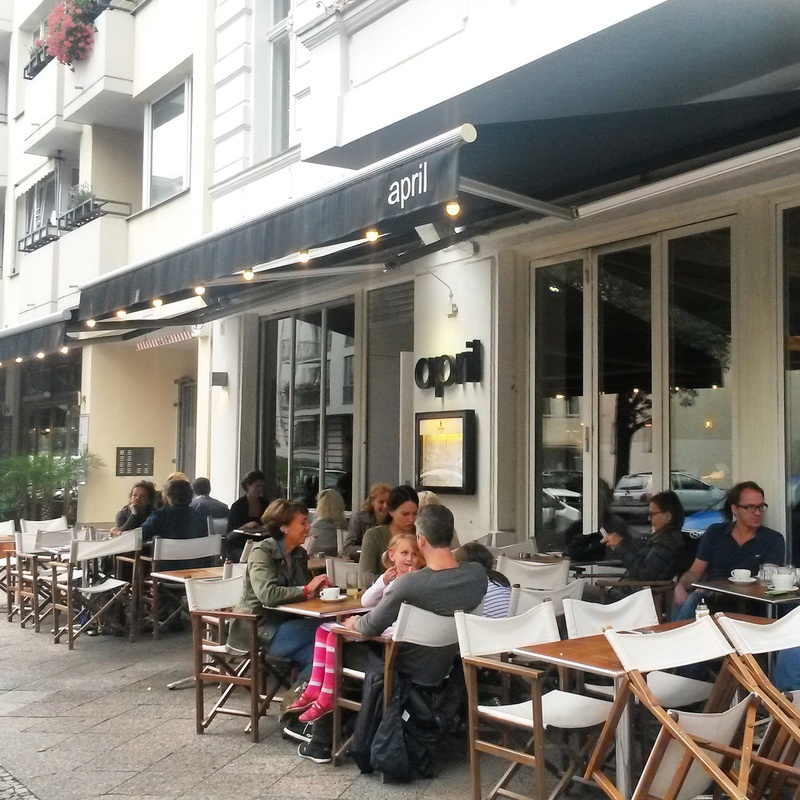 They have a great, big summer terrace on the corner of Kollowitzstrasse and Sredzkistrasse. They also have an ice cream counter and do catering. Try their brunches and homemade cakes! € 10-15. Clärchens Ballhaus – Dance hall and Biergarten (Auguststrasse 24, S-Oranienburger Strasse) Dance hall, dance school, restaurant, ballroom for special events, beer garden – all in one. First opened in 1913, this old complex survived the wars and divisions, and is one of the most exciting places in Berlin. They serve great stone-oven pizza. € 10 -15. 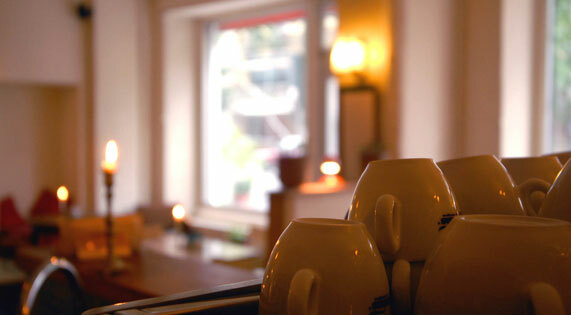 Zimt und Zucker – breakfast and brunch cafe (Schiffbauerdamm 12, S+U-Friedrichstrasse) Open daily 9:30am – 9pm. This is a gourmet cafe with a terrace on the river bank facing the former Tear Palace at Friedrichstrasse train station, and just down the street from Bertolt Brecht’s Berliner Ensemble Theatre.The service is a bit slow, but the food is delicious and worth the wait, and you can watch the boats go by on the river. Try their great brunches! € 10 -15. Monsieur Vuong – Vietnamese restaurant (Alte Schönhauser Strasse 46, U-Weinmeisterstrasse) – Best Vietnamese food in Berlin! Fresh and delicious daily specials, bowls, and soups. Great cocktails and fresh juices. Open daily from noon till midnight. Very busy at dinner time. If you are lucky, you will be greeted and seated by Monsieur Vuong himself! Thanks to Karen for introducing me to this place! € 10 -15. 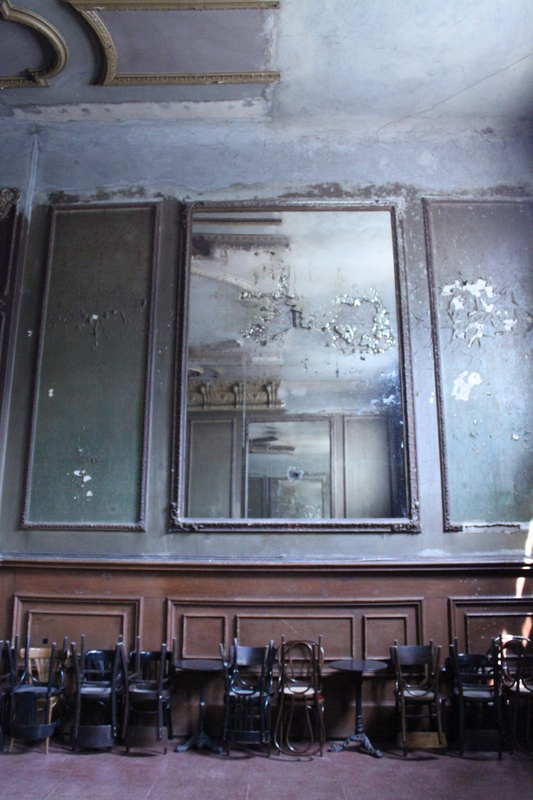 Tadschikische Teestube – Tea salon (Am Festungsgraben 1, S+U-Friedrichstrasse) – 5pm-12am, located inside the Palais am Festungsgraben, the tea room was a gift to East Germany by the Tajik Emabassy. Serving over 25 tea varieties, presented in a samovar, with assorted Russian snacks like pierogis with herbs and pelmeni, this is a hidden treasure, not easy to find without insider knowledge. Shoes off at the door, seating is on oriental cushions. €5 -15. Bunte Schokowelt Berlin – Ritter Sport Cafe, chocolate workshop, and store (Französische Straße 24, U-Französische Straße) Open daily 10am – 7pm and 8pm on Fridays. You can have your own flavour of Ritter Sport chocolate bar made, and while it cools, shop for your favourites in the gift shop, or have coffee and dessert or ice cream at the cafe upstairs. €5 -15. Fassbender & Rausch Chocolatiers – Chocolate café, restaurant, and shop (Charlottenstraße 60, Gendarmenmarkt, U-Stadtmitte) – Berlin chocolatiers since 1863. This is Berlin’s chocolate wonderland. The store on the ground floor displays gigantic chocolate sculptures (of the Brandenburg Gate, Reichstag, Titanic) and sells everything imaginable out of chocolate. Upstairs is the café and restaurant with an exquisite menu. €5 -15. Operncafé – Café at the opera (Unter den Linden 5, U + S Friedrichstrasse) – amazing breakfast buffet from 9am – 12pm (15 Euros), or Jazz brunch with life jazz every Sunday between 11am and 2pm (32,50 Euros). If you are just stopping by for Kaffee und Kuchen, or tea time, they have the largest selection of cakes (7-10 different cheesecakes alone), known as the “Tortenparadies.” Great variety on the daily menu as well. € 15-20. Zille-Destille – Pub (Propststraße 9, Nikoleiviertel) – right next to the Zille Museum, this cozy pub is dedicated to Berlin’s most dear photographer and illustrator, Heinrich Zille (1858-1929). Great Berlin cuisine and beers. Great variety of Berlin specialties. 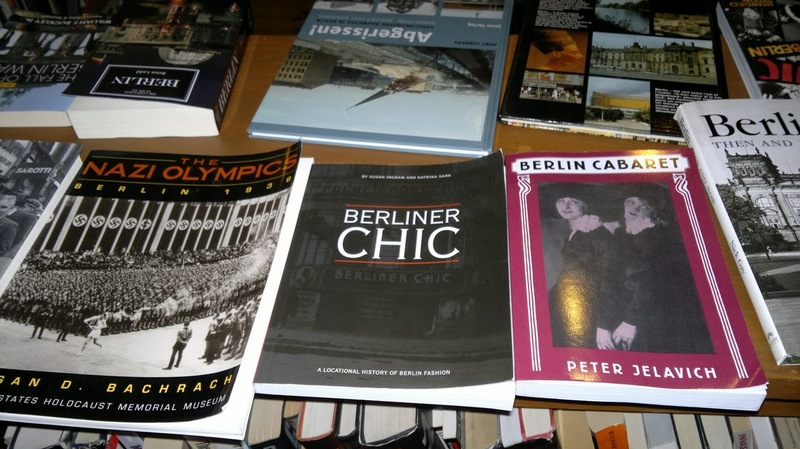 I discovered it while doing research for the Berliner Chic book. € 5- 10. April – Restaurant (Winterfeldtstr. 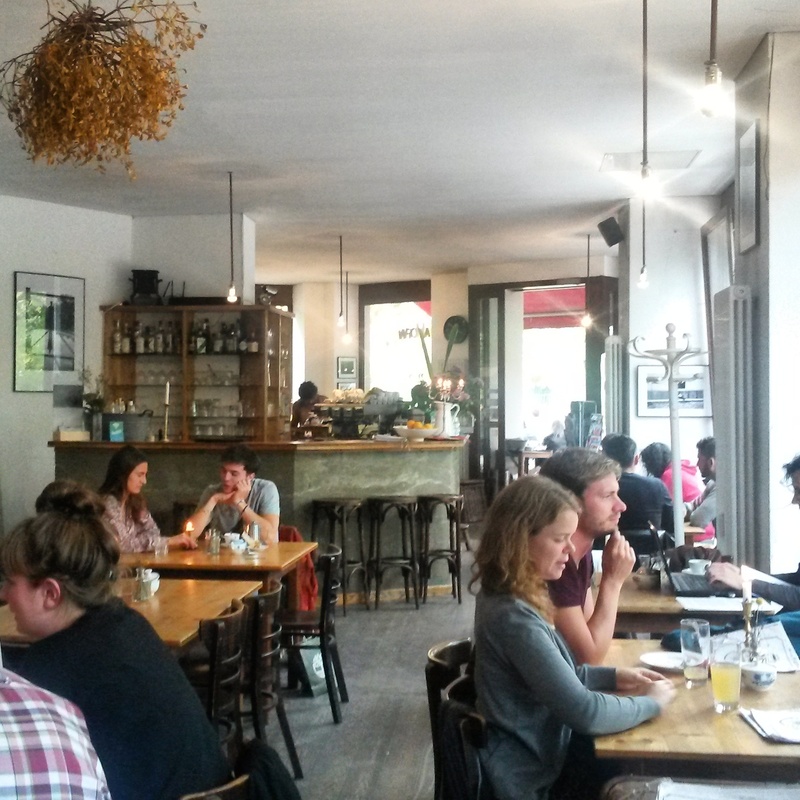 56, 10781 Berlin, U-Nollendorfplatz) – great place for brunch, lunch, and dinner. A mix of German and world cuisine and a wonderful atmosphere. The back room has white table cloths and black-and-white framed photographs of Cary Grant. All the brunch items are good and the Schnitzel on the dinner menu! Jasmine and I made this our hang out this summer, and Nina told me she used to live just around the corner and go there all the time. We all highly recommend this place! € 10 -15. Green Door – Cocktail bar (Winterfeldtstraße 50, 10781 Berlin-Schöneberg) You have to ring the door bell to be let in to this hidden establishment! Open daily 6pm-3am, happy hour between 6-8pm. Thanks to Karen and Sylvana for exploring this place with me! Try their cocktails! € 10 -15. Mastro Pizza – stone-oven pizza for take-out (Maaßenstraße 6, U-Nollendorfplatz) One of the best and most authentic Italian pizza places, with 15 different types of pizzas freshly made. They have a few benches outside their shop, but mostly specialize in take-out. Try their fresh arugula pizza and the eggplant-basil pizza. € 5-10 . 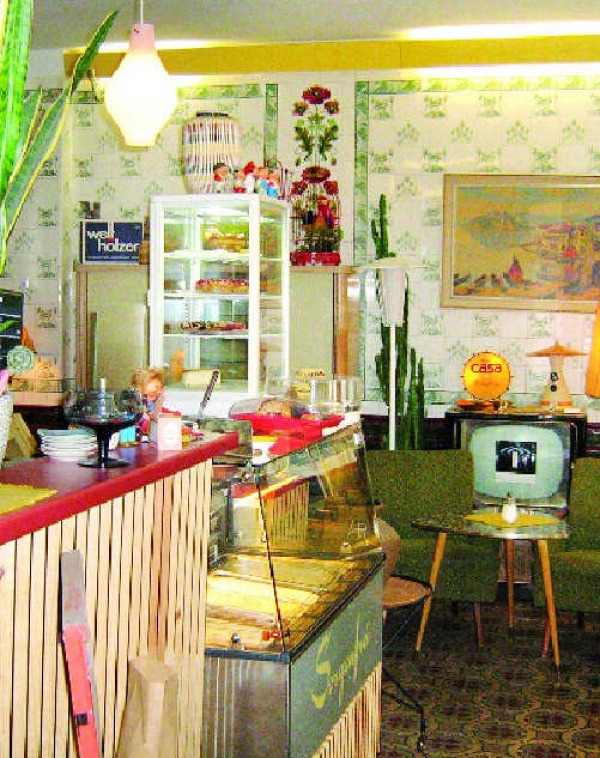 Café Sorgenfrei – Nostalgic cafe (Goltzstraße 18, 10781 Berlin, Winterfeldplatz, U-Nollendorfplatz) – closed on Mondays, open 10am till 6pm. Retro café with snacks, coffee, cake, and vintage 1950s and 60s antiques, books, postcards, and other collectables. Great place to find rare and unique souvenirs of Berlin. Hawaiian Toast is their speciality. My blogger friend Emily introduced me to this place. We had cake and browed through the collections of antiques and souvenirs. € 5-10 . Markthalle – German cuisine (Pücklerstrasse 34, Kreuzberg) – This spacious and open restaurant, with high ceilings, lots of light, and a private club in the back, has been made famous in the film Herr Lehmann (2003). 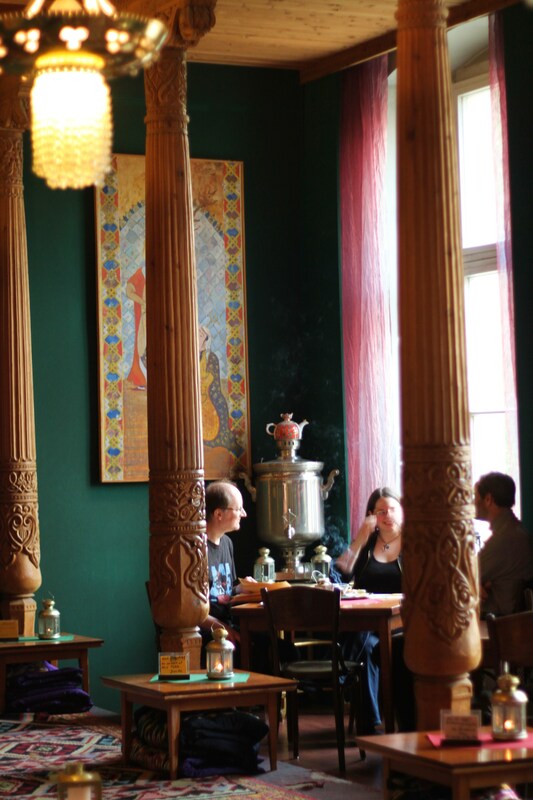 Located in the heart of the Turkish Kreutzberg, it serves the best German food in Berlin. Open for breakfast, lunch, and dinner. »Man soll dem Leib etwas Gutes bieten, damit die Seele Lust hat darin zu wohnen.« (Winston Churchill) Try the Wiener Schnitzel! € 10 -15. 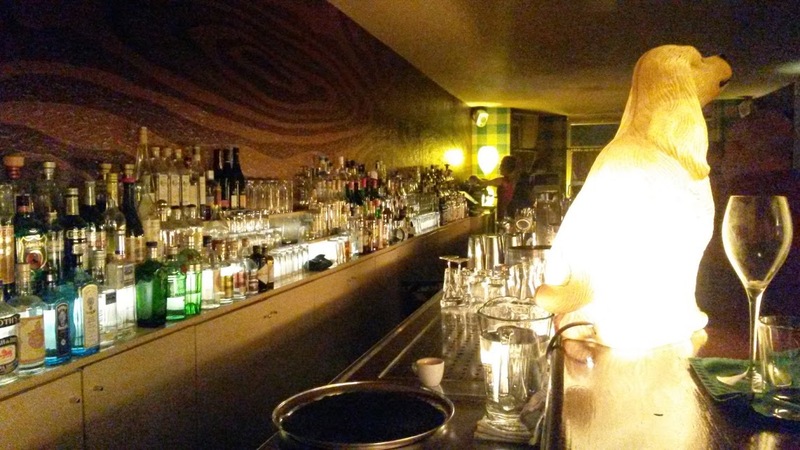 Mokkabar – Cocktail bar and restaurant (Gneisenaustraße 93, 10961 Berlin-Kreuzberg). Open daily 10am – 12am. Every Sunday after 8pm this cafe transforms into a jazz bar. Beautiful atmosphere. Thanks to Bea for introducing me to this place! € 10 -15. Cube – Sushi bar (Zossener Straße 18, 10961 Berlin-Kreuzberg) Open daily 12-11:30pm. Great sushi! Thanks to Nicole and Jean-Paul for introducing me to this place! € 10 -15. Mano Café – Café and bar (Skalitzer Straße 46A, 10997 Berlin-Kreuzberg) Similar to Wohnzimmer in Prenzlauer Berg, but with even cooler decor and layout. Thanks to Melody for introducing me to this place! Open daily 2pm-1am. Try their cocktails and cakes! € 5-10 . Kaffee A.Horn – Café and bike shop (Carl-Herz-Ufer 9, Ecke Baerwaldstraße, 10961 Berlin-Kreuzberg) Lovely, sunny and spacious café by the canal in Kreuzberg. Open daily 8am-2am. Great for brunch or for work-dates! Thanks to Bea for introducing me to this place! € 10 -15. Solar Restaurant and Lounge – Rooftop bar and lounge (Stresemannstraße 76, 10963 Berlin, S-Anhalter Bahnhof). Great view of the city. Open daily 6pm-2am. The restaurant is a floor below, and the bar and lounge is on the top – cozy sitting with large swings. Try their cocktails! € 10 -35. 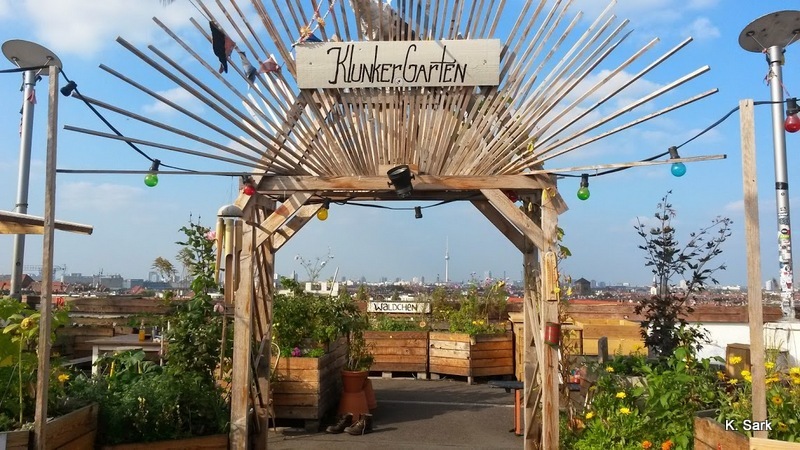 Klunkerkranich – Rooftop café and garden (Karl-Marx-Straße 66, 12043 Berlin-Neukölln, U-Rathaus Neukölln) This is a still-hidden, but increasingly popular place on top of the parkade of of the Neukölln Arkaden shopping centre. Entrance at Postbank / Bibliothek, elevater to 5th floor parkade, then on foot up to the 6th floor. Open daily 10am-12am, Sun 12pm-12am. Thanks to Stéphanie for introducing me to this place! Service is a bit slow but try their Pizza! € 10 -15. Buchhandlung Walther König (an der Museumsinsel, Burgstraße 27, 10178 Berlin, S-Hackescher Markt) – 10am to 8pm, closed on Sundays. 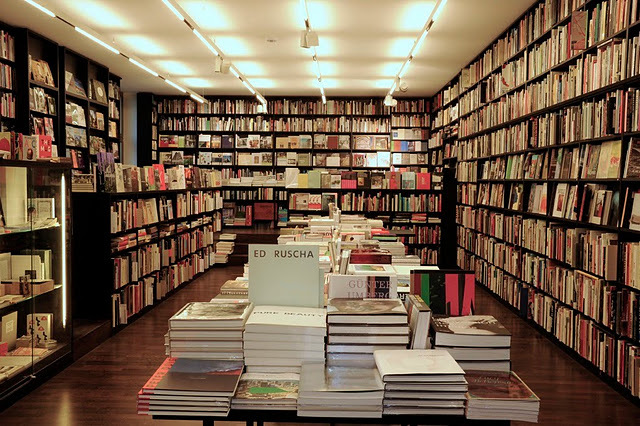 Great selection of art, design, and fashion books from all over the world. In close proximity to Humbolt University, Hackescher Markt, Museum Island, and the soon to be constructed Humbolt Forum. 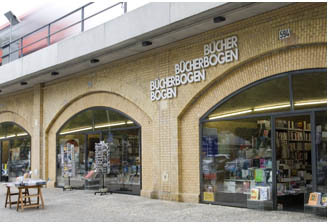 Bücherbogen (Stadtbahnbogen 593, 10623 Berlin, S-Savignyplatz) – 10am-8pm, closed on Sundays – specialize in Art, photography, design, film, and fashion books. They have three locations in Berlin, but Savignyplatz is original because it’s in the brick arch-building under the subway tracks. Do you read me? (Auguststrasse 28, 10117 Berlin, U-Rosenthaler Platz) – 10am-7:30pm, closed on Sundays – specialize in magazines and readings from around the world, fashion, photography and art, architecture, interior design, culture and society. An exhibition, entitled »what do you read? 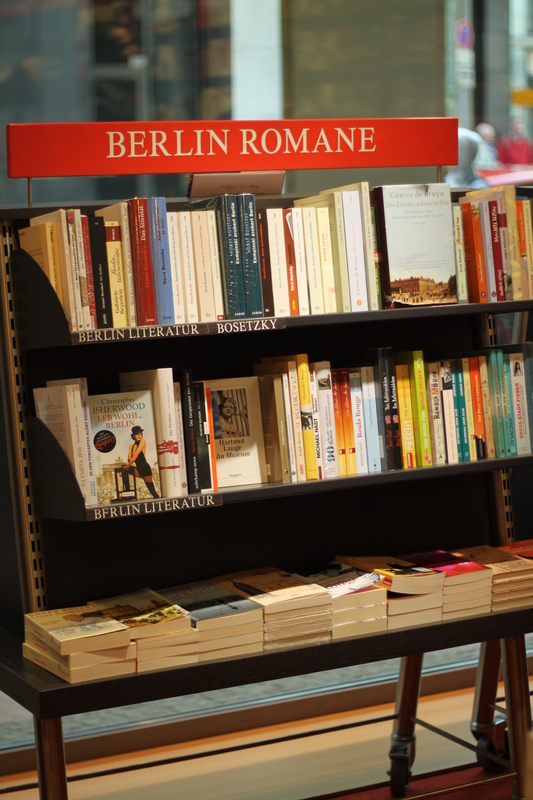 !« based on lists of books and magazines recommended by inspiring personalities is on display in the Reading Room in Potsdamer Strasse 98. 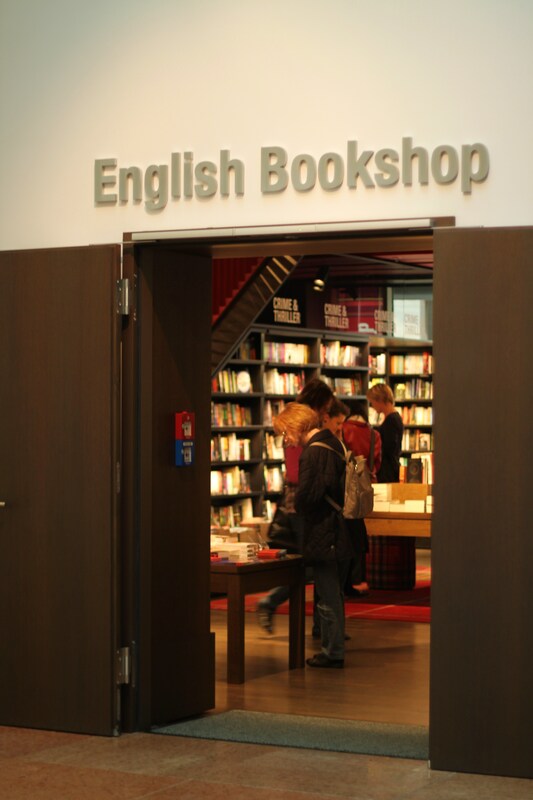 Dussmann KulturKaufhaus (Friedrichstraße 90, 10117 Berlin U+S-Friedrichstrasse) – open 10am – 12am, closed on Sundays – large collection of Berlin books, DVDs, Music, and now also a large English book section. 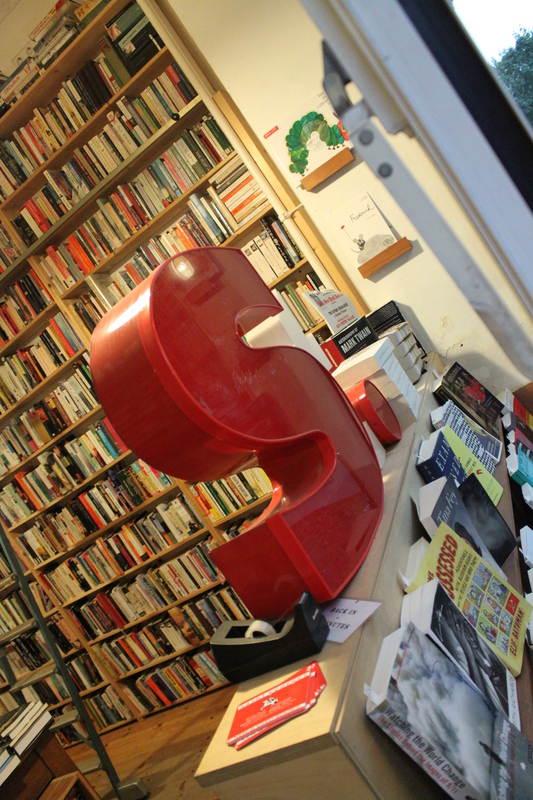 Open late every day (except Sundays) and have occasional book presentations and readings. pro qm (Almstadtstr. 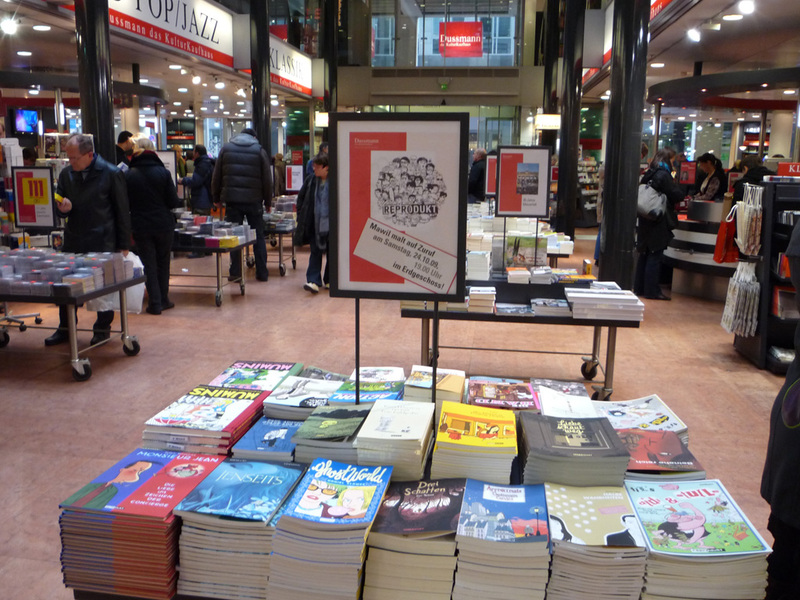 48-50, 10119 Berlin, U-Rosa Luxemburg Platz) – 11am-8pm, closed on Sundays – specialize in Berlin books, politics, pop-culture, art, architecture and design. St. George’s English Bookstore (Wörther Str. 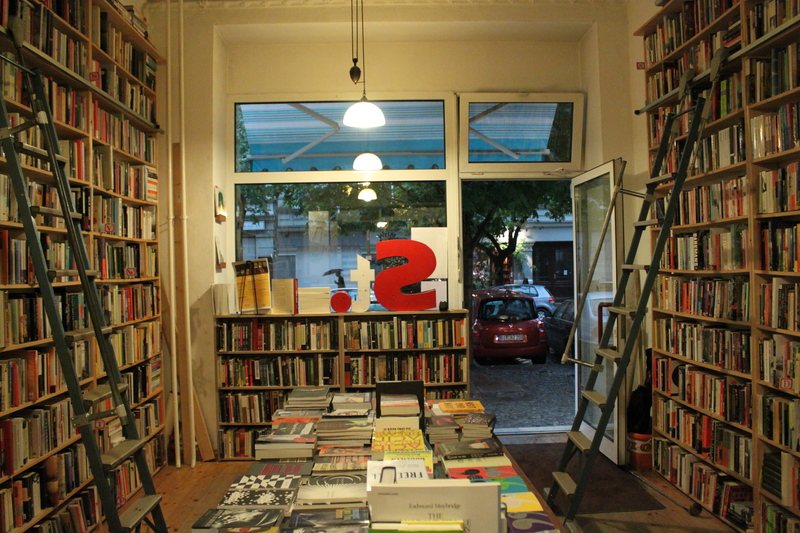 27, 10405 Berlin, Prenzlauer Berg) – 11am-8pm, closed on Sundays – large selection of English books, special events on Wednesday night. Close to Kollowitzplatz. Shakespeare and Sons (Raumerstrasse 36, 10437 Berlin, near Helmholzplatz, Prenzlauer Berg, with a second location in Friedrichshain, Warschauerstr.) Same English bookstore and cafe as in Prague. Open every day from 9am-8pm, including cafe, and from 10am on Sundays. 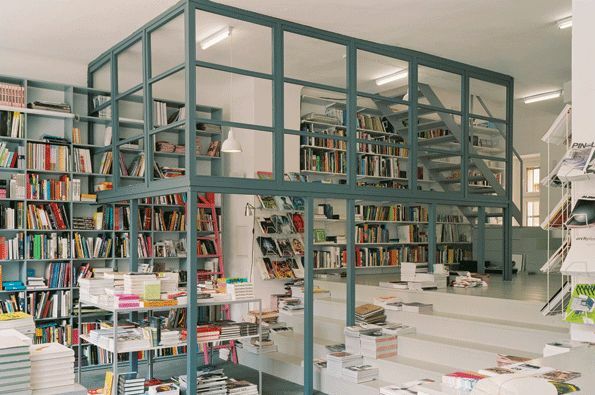 Great space and atmosphere, with different rooms and nooks for cozy reading and working hours. Uslar & Rai (Schönhauser Allee 43, 10435 Berlin Prenzlauer Berg, U-Eberswalderstr.) Open 10am-7pm, closed on Sundays. Great selection of feminist books and book readings. Buchladen zur schwankenden Weltkugel (Kastanienallee 85, 10435 Berlin – Prenzlauer Berg, U- Eberswalderstr.) Open 11am-7pm, closed on Sundays. A political book store with a feminist book shelf. This entry was posted in Berlin, Café Cultures, Restaurants. Bookmark the permalink.